On Tuesday, March 31 the FEI Bureau awarded the 2014 FEI World Equestrian Games to the region of Normandy, France. This will be the seventh edition of the FEI World Equestrian Games and the first one to be held in France. “The allocation of the 2014 FEI World Equestrian Games to the region of Normandy in France is an important development for the future of our sport. The bid committee in cooperation with the French Equestrian Federation have worked for eight years and presented a project of outstanding quality and vision which enjoys the support of the French government and regional authorities, and presents us as a sport with an exceptional platform in the very heart of a region that shares our passion for horses,” said FEI President HRH Princess Haya Bint Al Hussein. The FEI World Equestrian Games are the combination of the world championships of all eight FEI disciplines – Jumping, Dressage, Eventing, Driving, Endurance, Vaulting, Reining, and Para-Equestrian – held concurrently at the same place. They take place every four years. No fewer than 900 horses, 800 riders and drivers from 60 nations and 300 000 spectators are expected to gather for two weeks of competition in August 2014. The FEI World Equestrian Games will be broadcast widely and is expected to generate important economic, tourist and sports benefits. 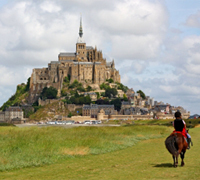 Normandy is the symbol of the vitality of the French horse industry. It boasts a natural environment favorable to all horse activities, first rank infrastructure, renowned equine research centres, and high level industry related to horses. 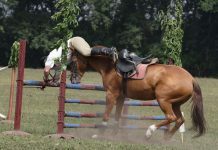 Many competitions are organized in Normandy each year. good for them. what a beautiful place to have it.